There are many highlights for those that choose to live in Auckland, but I guess it is the location that stands out for me. As mentioned on the New Zealand Tourism website Discover Auckland: centred between two harbours and dotted with 48 volcanic cones plus a bordering rainforest, take time to discover that Auckland is a city like no other. In this post I have focused only on Auckland for location. Auckland is situated on a narrow bit of land that separates the two oceans. At its narrowest point there is less than two kilometers (about 1.25 miles) that separate the Hauraki Gulf which opens on the east into the Pacific Ocean, and the Manukau Harbour which opens on the west to the Tasman Sea. The coastline on the East is generally quite calm with white sand beaches great for swimming and expanses of water for boating, fishing and sailing. Auckland is known as “The City of Sails” and this is obvious many weekends as you see the yachts out in the Hauraki Gulf. The West coast is the opposite – it is wild and remote with miles of black sand beaches with crashing surf hitting the coastline from Tasman Sea which is the ocean that separates New Zealand from Australia which is about 2,000 kilometres (1,200 miles) away. There are two large harbours on the West Coast; the Manukau Harbour and the mightly Kaipara. The Kaipara Harbour is one of the largest harbours in the world but it is also shallow. It extends for some 60 kilometres (37 miles) from north to south. and it covers 947 square kilometres (366 sq miles) at high tide, with another 409 square kilometres (158 sq miles) of exposed mudflats and sandflats at low tide. Due to the vast size of the harbour there are huge tidal currents. It is a breeding ground for many fish species including sharks and rays so has some excellent fishing for those that get out. It is quite awesome in many respects and the last time I went fishing there we saw a pod of killer whales which was very cool to see. The Manukau Harbour is the second largest natural harbour in New Zealand by area and like the Kaipara is shallow with a huge tidal flow. 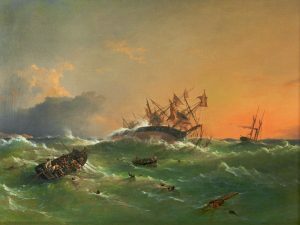 The Manukau heads is known for New Zealand’s most tragic shipwreck occurred on the bar in 1863 when HMS Orpheus ran aground in clear weather with a loss of 189 lives. There is still an active port at Onehunga (within the Manukau) but it is not a large port. Living in New Zealand is great, but in the past the remoteness has been a barrier especially for doing business. Today this is not such a big issue. Of course tourism here is booming and while we are not going to attract weekend travelers, we have seen the number of tourists increasing a lot over the past few years. People are attracted to New Zealand for many reasons, but the scenery, wilderness and lack of population all contribute to make this country appeal to many. Trade of primary produce is still a huge part of business in New Zealand. Much of this is shipped from Auckland, so the distance to the markets is a barrier due to both the time it takes to get produce to the markets and the transportation costs. This has seen many businesses look to producing specific produce to target the high-end niche markets rather than the tradition mass markets that we once targeted. The internet has certainly changed things for many New Zealand businesses and Kiwi’s have adapted to the technology sector well. There are many success stories where Kiwis have created digital products and now many are using the internet to make money with home based businesses too. There are a lot of examples of people that have started online business based in New Zealand but are making money overseas. Think of Salehoo – a business created out of Christchurch that allows you to set up an online store and making money selling other peoples products either here in New Zealand or overseas. With drop shipping you are buying at wholesale prices and selling the products, but it is a low cost business as you only purchase the products after you have already sold them and been paid. This is a great home business opportunity – CLICK HERE to learn more. New Zealand is quite a small country and it’s hard for a Kiwi to imagine living in the UK which is a smaller country than ours with a massive population in comparison. We take it for granted that we can go to a beach and be the only people on it.